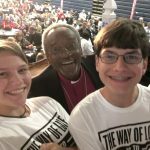 Archbishop Michael Curry spoke at the 112th Annual Council Convention this past week on November 9. 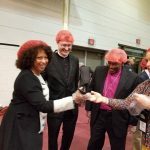 The convention was held at Holy Innocents Episcopal School and Parish in Atlanta as parishes from all over the diocese gathered to meet and worship together. 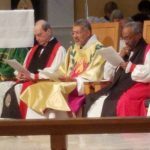 Archbishop Curry spoke during the council meeting on Friday, and celebrated Eucharist on Friday afternoon. 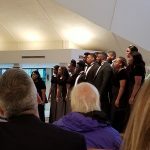 Present at the convention were our delegates Greg Andrews, Jay Jones, and Janis Williams, along with Mallard and Althea Benton, Sheila Ferrell and Richard Morris who all sang in the choir at Eucharist, and Jessie and Jacob Hurst who attended the youth lock-in held in conjunction with the event. 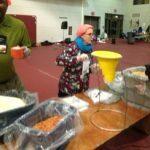 In addition, attendees packed 15,000 meals for the hungry to be sent wherever they are needed in the world. This adventure was amazing. 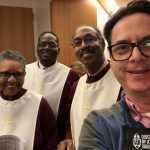 I was a newbie, in rooms with a lot of white collars and quite a few black cassocks, and so proud to be among them. 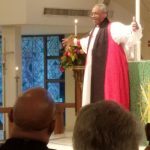 The first familiar face after finding Jay Jones and Greg Andrews, was Bishop Wright, welcoming me. 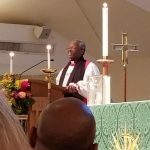 I have only been a part of the Episcopal Church for 20 years, and was thrilled to be there and to find out more about our church on a broader, higher level. In spare moments, I visited the tables from different ministries to learn more about opportunities to serve and to share. 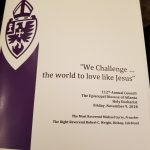 The purpose statement of the 112th Annual Council is Challenging Ourselves and the World to Love Like Jesus. 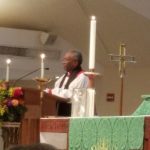 The highlight of the weekend was the Eucharistic service Friday afternoon. 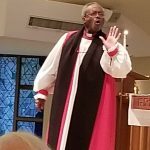 Presiding Bishop Michael Curry gave the sermon with an engaging story of the Good Samaritan. 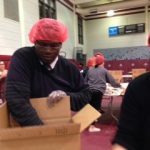 Greg and I participated a little later in the service project, helping to make 15,000 food packages which will be sent all over the world when and where they are needed. 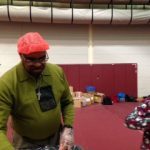 Many of the young people participated in a Lock-in on Friday night, where six very tall posts were made, which will travel around the world to display and convey some of their concerns today. The final worship service Saturday morning was conducted entirely by the Youth with songs, a sermon, and prayers. If I have the opportunity to go again, I would love to!